Northwestern College’s Living Your Faith (LYF), a youth theology camp for high school students, has received two grants to extend the impact of the program. A $5,000 grant from the Forum for Theological Exploration will fund a project that increases the cultural intelligence and impact of LYF staff, service and cross-cultural experiences. With the funding, Rahn Franklin, director of multicultural student development at Northwestern, will be trained and accredited by the Cultural Intelligence Center. In turn, he will work with LYF staff to select and train mentors and determine service sites and partners for the 2019 LYF event. “The accreditation and training Rahn will receive will also empower him to continue advancing Northwestern’s Vision for Diversity throughout the Northwestern community,” says Daniel Den Boer, LYF director. A $3,500 grant from Foundations of Christian Leadership will support an ongoing project designed to extend the reach of LYF into the homes, schools and churches of LYF participants. Titled “Leading in Your Faith,” the project recruits and trains LYF participants into a position of leadership apprenticing within their home church; places the students in a mentoring relationship with a middle school student; and allows the students to imagine, design and build a mission project within their own context. 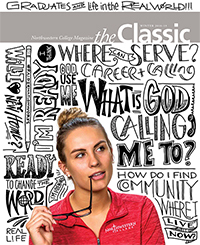 “LYF has opened the door to new partnerships between churches and Northwestern College in order to impact high school students for Jesus Christ. These grants push us into even further collaboration with diverse communities,” says Den Boer. LYF is funded by a Lilly Endowment grant and is designed to help teenagers explore and deepen their Christian faith. During the weeklong event, participants study the Bible and theological ideas with Northwestern faculty and staff, engage in service and volunteerism in the region, enjoy community entertainment and excursions, and experience campus life while living in a Northwestern residence hall. LYF will take place June 23–28, 2019. More information is available at lyf.nwciowa.edu.